Not expecting any miracles, but here's hoping the Dems can make the necessary changes to our health care system. With a little modification, I found the caduceus to be very accommodating as a pogo stick. The CONCEPT KING strikes again. This is like the old mainstay of the gag cartoonists...the desert island. There's always a new way to do it... like the caduceus. This is probably the most creative way I've ever seen it. I'm in humble awe...having done about 14,000 of them myself over the years. Boing...Boing... Great piece of art, says it all about this health care mess. Have you seen Sicko? It will piss you off. The idea of maximizing profit off of peoples health and well being suddenly seems so wrong. Not sure it will ever fly here in the "land of the free" I think the money making insurance companies, HMO's etc are just too entrenched. I hope I'm wrong because what's going on now is a crime. I just paid 2k for a routine exam for my wife. I'm assuming the illo is to make the idea of passing universal health a daunting task indeed-nice work. As Randall said, you are indeed the king of concepts. Love this idea. Like you, I am not holding my breath for health care changes. But I sure hope they happen. 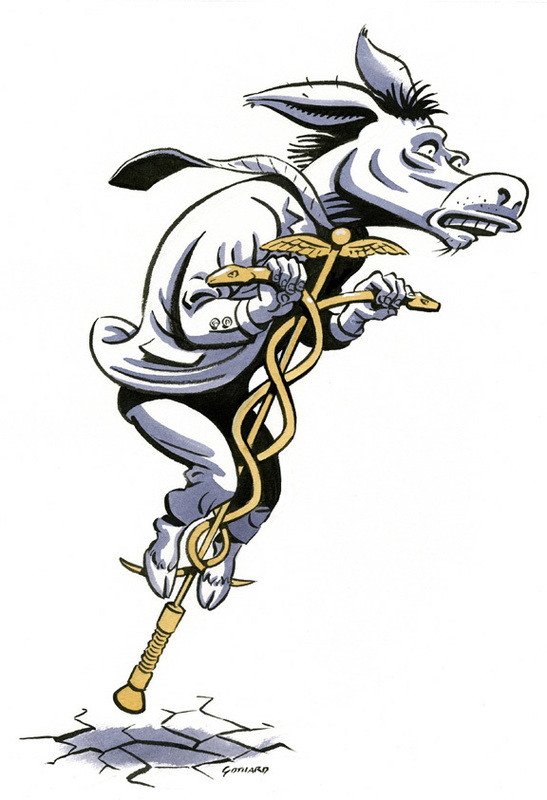 The caduceus as a pogo stick?, brilliant. I too, have done a hundred caduceus concepts and this one rocks!. Hi David, powerful image. I like the colors too. Hey, David... what Christopher said: your header just knocks me to the floor! Thanks all! Randy - coming from you, that title is quite a distinction. Christopher & Lou...thanks for the feedback on the header. And Walter - it's taken me awhile to simplify an approach to color that works for me. Poignant, as always. Great piece David. David, really like your octopod header. I think that pogo stick has retail possibilities.